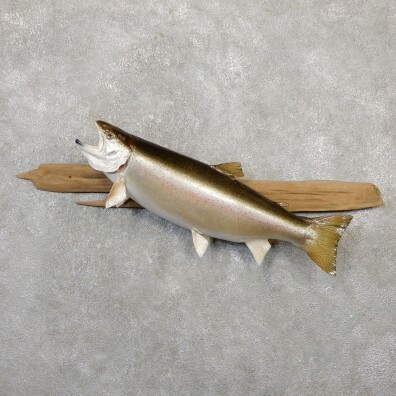 This is a fantastic Steelhead taxidermy fish mount, measuring 30" long, with a girth of 17.50" and an estimated live weight of 12 lbs. A steelhead is a rainbow trout that goes out to sea compared to a regular rainbow trout that stays in freshwater only. This Steelhead is posed facing the viewer's left side with an open mouth, swimming upwards on a driftwood plaque. 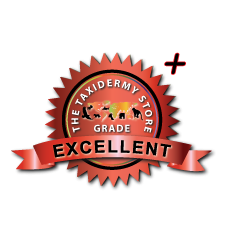 The fins are in great condition, the painting is beautiful, and taxidermy work is outstanding, all of this combined has helped this item earn our Excellent Plus™ overall quality rating. All applicable dimensions are included to help ensure this item will fit within your intended display space.